The creative team of writer Magdalene Visaggio, artist Sonny Liew and colorist Chris Chuckry returns in the third issue of this series that delves deep into the human psyche and how it is perceived by those around us. Thus far in this series, main character Caroline Sharp, former hero known as Chrysalis, has faced some life-altering events. One of the driving forces of Caroline’s actions is the fact that she wants to die, but, because of her powers, she can’t for all she knows. It’s incredible that a comic can be this gripping where the main character wants to end their life, yet that is a real credit to series writer Magdalene Visaggio, because there are so many more layers to this series. The issue also opens with the appearance of 4 celestial being talking about Caroline’s encounter with the Space God Astrolas. They are speaking about how cosmic order will now be thrown into chaos. It will be interesting to see how big of a part they play going forward. 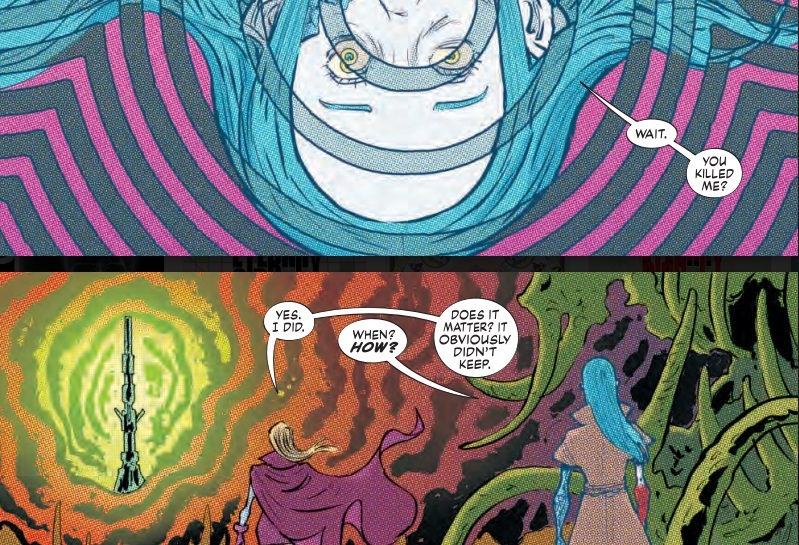 Eternity Girl writer and co-creator Magdalene Visaggio has really found a new way in which to speak about what is normally a social stigma. Caroline has reached her breaking point. After a confrontation with her former boss that didn’t go as well as planned, Caroline now finds herself in limbo, as she has to go into hiding. Visaggio’s writing here is subtle, yet so powerful. The fact that Caroline didn’t feel comfortable in her own apartment and now has to hide in a world where she feels even more uncomfortable speaks huge volumes. Visaggio gives more interaction between Caroline and Madame Atom, her longtime foe who is also deceased. Atom is so ingrained into Caroline’s head that, at one point, Madame Atom takes over as Caroline’s therapist. Caroline has now become so comfortable with Madame Atom that she no longer is presented to her as a challenge, but rather an ally. Atom claims that she knows how to end Caroline’s life, and has encouraged her to destroy a gigantic machine called the Chaos Engine that was being guarded by Astrolas. Atom says that this will end the endless cycle of torment that Caroline endures. This revelation shows just how far Caroline has spiraled out of control. She may even think this is totally normal. That is how in depth Magdalene’s writing is with this character. Artist Sonny Liew has some real special moments in this issue. As previously mentioned, Liew has drawn an incredibly powerful panel of Madame Atom taking the place of Caroline’s therapist. Even though this is just one picture, it’s significance is huge. This one picture alone says so much about Caroline’s mental state. He also has some real spectacular work towards the end of the issue that is best left to be seen as Caroline comes to some startling discoveries that are best left unspoiled. Chris Chuckry really gets to shine in the panels that take place in outer space. They are truly gorgeous panels that help to set apart reality from this other journey that Caroline is undertaking. The contrast between the bleakness of actual reality and the bright beautiful colors in the vacuum of space is breathtaking. Like Liew, he also has something special at the end of this issue that shouldn’t be spoiled. This creative team of Visaggio, Liew and Chuckry have really worked well to establish the difference between reality and Caroline’s journey in their own ways. From the writing to the art and color, they have all left their signature mark and kept everything in a cohesive flow that really helps make this series something special.